Parallel to .0003 on all sides. Up to .0003 over allowance for nominal lapping. 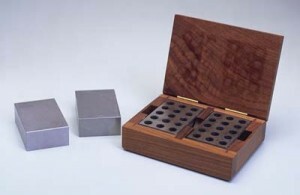 Standard blocks have 23 holes; 5 holes tapped 3/8-16, 18 drilled through. Blocks with no holes are also available. Standard sets are supplied in a cardboard box. Wood box available at an additional cost.